There was a Hoopa rally at Lewiston Dam today. 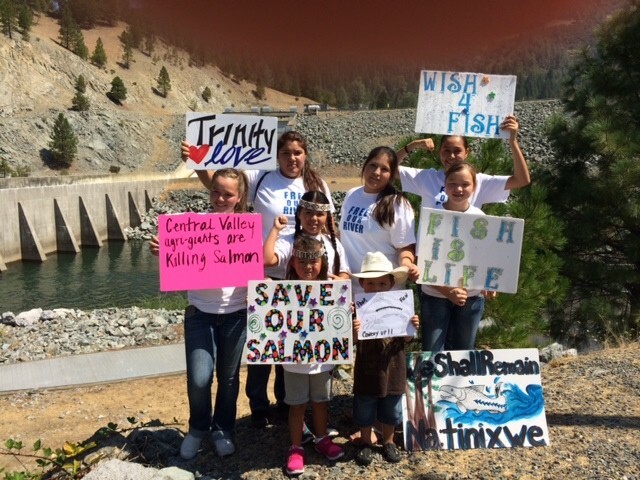 A federal judge with the Eastern District Court of California today denied a temporary restraining order and preliminary injunction sought by Central Valley Project water users to stop extra releases of water from the Trinity reservoir at Lewiston Dam into the Trinity River. The U.S. Bureau of Reclamation approved those flow augmentation releases last week, and the San Luis & Delta-Mendota Water Authority and Westlands Water District sued to stop them several days later. The two had another suit already outstanding with the court over emergency flows last year. In his decision, U.S. District Judge Lawrence J. O’Neill talked about both cases. He said the emergency releases for salmon in the Trinity do not decrease the amount of water the plaintiff's users are getting from the project (which already, in these drought conditions, is zero for agriculture users and curtailed some for wildlife refuges). He acknowledged that releases into the Trinity this year likely could lower the reservoir enough that next year's the water supply could be impacted, meaning continued short supply (already in effect) for the plaintiff's water users. But, he said, "the balance of the harms does not warrant an injunction at this time." "Even if the Court were prepared immediately to issue a final ruling on the merits in favor of Plaintiffs, an injunction would not be automatic," O'Neill wrote. "The potential harm to the Plaintiffs from the potential, but far from certain, loss of added water supply in 2015 does not outweigh the potentially catastrophic damage that 'more likely than not' will occur to this year’s salmon runs in the absence of the 2014 [flow augmentation releases]."